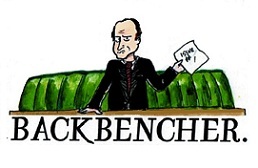 The Backbencher – James Wharton’s right: we need an EU referendum now! James Wharton’s right: we need an EU referendum now! On Friday, Twitter was flooded with excited Tory MPs proclaiming themselves as the party giving Britain a choice over membership of the European Union, as a result of James Wharton’s Private Members Bill being debated in the House of Commons. Yet the Commons chamber remained mostly empty for the vast majority of the debate. That’s a huge shame because Wharton’s bill is the most important to pass through the Commons in years. The time for dithering is over: we must have a referendum on Europe! Britain has had a referendum over Europe, once, in 1975. Back then, the proposal on the table was to stay in the European Economic Community, or the Common Market, which was overwhelmingly approved by 67% to 33%. But the Common Market in no way resembles the EU today. British citizens in 1975 were voting for a union to ‘bring together the peoples of Europe, raise living standards, promote growth, help the poorest regions of Europe and help maintain peace and freedom.’ They had no idea of the massive expansion the EU would undergo and the criminal loss of sovereignty this would entail. After Britain’s affirming yes vote in 1975, the EU has engorged to become unrecognisable. Up to 50% of British laws originate in Brussels according to David Cameron, and Nigel Farage places the level at around 75%. The vast majority of this is regulation that is strangling to British business and another layer of meaningless bureaucracy. The Telegraph estimates that the EU costs us £118bn a year, and that is only going up. Despite all the claims that the EU is good for British business, we operate a massive trade deficit with member countries. What is clear is that we have never had a vote on membership of the inflated juggernaut that the EU has become. So surely Britain has earned its right to vote on EU membership? Well, not according to Ed Miliband and Nick Clegg, who both oppose Wharton’s bill, on the basis that it’s far too dangerous to give the British public a vote, because we might just go and vote to leave the EU. Of course, the irony for Nick Clegg is that when he was in opposition in 2007, he pledged a referendum on full membership, going beyond the Tories’ promise at the time to let the nation decide on the Lisbon Treaty. If anything, this unwillingness on the part of the Lib Dem and Labour parties reveals an inherent distrust of the electorate, afraid that they may come to a conclusion they would not support. We must not let narcissistic politicians like these decide on something as important as our role in Europe. But the strongest argument overall isn’t that we haven’t had a referendum for a while, or that it would be worth doing almost anything to spite Ed Miliband, it is that the British public desperately want a referendum. The rise and rise of UKIP, from the political doldrums in 2010 to Britain’s third party in 2013, indicate just how desperate the British public are for a party strong enough to stand up to the European behemoth. Extensive YouGov polling has found that over 65% of people want an EU referendum, and 86% of Conservative MPs have supported the motion. As such, the fact that Wharton’s bill looks unlikely to go through is farce. It represents one of the biggest abdications of responsibility imaginable by the Liberal Democrat and Labour parties, and can only ensure that the disillusionment with the political establishment will increase. One can only hopethat this is reflected at the ballot box in 2015, and that a referendum can go ahead in 2017. Because it is long, long overdue.